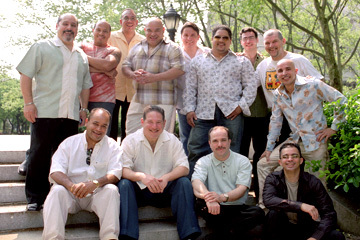 The Spanish Harlem Orchestra is, from back row, left: Ray de la Paz, Bobby Allende, George Delgado, Pablo Nunez, Marco Bermudez, Willy Torres, John Walsh, Dan Reagan and Jimmy Bosch. Front row, from left: Peter Nater, Mitch Frohman, Oscar Hernandez and Maximo Tores. So here's the deal, Compadre, Question Numero Uno: the Harlem Spanish Orchestra, one of the world's great Latin ensembles, is headed this way to blow the roof off Leeward Community College theater, and so -- is it physically possible to sit back and listen, or will audiences take to the aisles and shake their caderas? "Hmmm," pondered band leader and pianist Oscar Hernandez. "For me, as a composer and musician, it tickles me when people pay attention and listen to the music. I know it is dance music, essentially, but with us you can also kick back and enjoy the rhythms and harmonies, the sophisticated arrangements, the interplay between the percussion section, the bass and the piano, the horns and the singers -- there's so much going on to appreciate, just from a listening aspect, even though it is -- yes, in its true aspect -- dance music." The LCC theater is a wonderful venue, but not known for its throbbing boogie pit. "Our Latin jazz repertoire lends itself to just sitting and listening. We've been playing many of the big jazz festivals all over the world," laughed Hernandez. "It's all good!" Hernandez is a guy to sit down and listen to. In addition to the Grammy-winning Spanish Harlem Orchestra, the Bronx native has been steering the Ruben Blades Band and performing with giants such as Tito Puente, Celia Cruz, Julio Iglesias, Earl Klugh, Dave Valentin, Johnny Pacheco, Kirsty MacColl and others. In the spare minutes he has left, he is arranging and producing music for Paul Simon's "The Capeman" and tuning up the Broadway-bound version of "The Mambo Kings." "I'm pretty busy," allows Hernandez. "Thank God, I feel blessed. Putting together the band wasn't my idea, but nonetheless it turned out to be my mission. I think God put this in my path for a particular reason. I've been consumed by it -- thankfully so, because we've been blessed by a lot of acclaim and recognition and we're working at a time when the music business is really bad. "But we're working! And we're working more or less on our own terms. There are always things you have to compromise, but in general we're lucky to be doing what we're doing." The Grammy-winning group is finding that their Latin sound appeals to audiences from all corners of the globe. 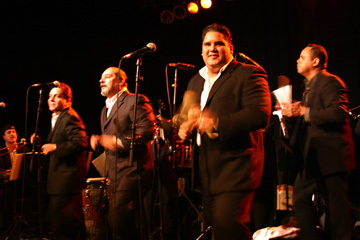 The 13 members of the Spanish Harlem Orchestra, all of whom started out playing in the smelter of New York's fiery Latin nightclub scene decades ago, find themselves in a new age and on a more worldly stage. The nightclubs have shuttered, but the rhythms of salsa are percolating far, far away from New York. "Salsa now has more of a world appeal, and lucky for us, because we've been traveling the world, bringing the music to everywhere, garnering praise and finding great audiences, taking our music to different parts of the world and playing for all kinds of diverse audiences," Hernandez said. This concert will be the band's first in Hawaii. "I hear you have something like 100,000 Puerto Ricans over there. I guess they moved to Hawaii looking for a better way of life and found the sun and the beach and said, 'Hey, this is for us!' "
Hawaii is likely to be friendly to the group's sizzling Afro-Cuban/New York jazz groove, but what about the remote pockets of the world? "With computers and the media being so vast, our music is getting out there for sure," said Hernandez. "Two months ago we were in Dublin, Glasgow, Bristol, Yorkshire, Bratislava, Prague -- if you'd have told me 25 years ago I'd be playing in some remote area of England where there would be 500 people in front of the stage dancing to our music, I'd have said you're crazy. Now that's what it's like -- hundreds of British salsa dancers!" It's becoming a Latino world? "No matter where we go, no matter where we play, there are always a few Latinos in the audience. Even England, even Bratislava, a few Latinos show up," laughed Hernandez. "Don't know how they get there, but Latinos are out there everywhere. "Anything that can bring us together and give us more understanding of each other's cultures and to be more compassionate, that's a great thing. The world needs more of that, that's for sure."